Titanium is 30% stronger than steel, but is nearly 50% lighter. Titanium is 60% heavier than aluminum, but twice as strong. Titanium has excellent strength retention to 1,000 degrees Fahrenheit. Titanium is alloyed with aluminum, manganese, iron, molybdenum and other metals to increase strength, to withstand high temperatures, and to lighten the resultant alloy. Titanium’s high corrosion resistance is also a valuable characteristic; as when exposed to the atmosphere, titanium forms a tight, tenacious oxide film that resists many corrosive materials, particularly salt water. In the 1950s, the titanium metal industry was established primarily in response to the emerging aerospace industry, which used it in the manufacture of airframe structural components and skin, aircraft hydraulic systems, air engine components, rockets, missiles, and spacecraft, where these properties are invaluable. The military also uses titanium in its guided missiles and in artillery. Other practical applications have evolved over time such as shipbuilding: in submarines, ship’s propellers, shafts, rigging, and other highly corrosive parts. Titanium is being increasingly utilized for medical applications due to its lightweight, its strength, and its hypoallergenic properties, as titanium is also nickel free. Titanium products are becoming increasingly utilized in other industries as well, from petrochemical applications to sporting goods. For more information or to receive a prompt titanium alloy price quote, please contact us at 800 398-4345 or 954-977-0666 or submit the Request Information form on the right side of this page. Titanium Grade 1 is an unalloyed, low strength titanium product containing low oxygen with high formability; this titanium grade is used in airframes, heat exchangers and desalination units. Titanium Grade 2 is an unalloyed, medium strength titanium product. This titanium grade is used in airframes, aircraft engines, and marine parts; good weldability and corrosion resistance are its distinguishing characteristics. Titanium Grade 3 is an unalloyed, high strength, titanium product providing excellent corrosion resistance and good weldability. This titanium grade is primarily used in airframe and aircraft engine parts. Titanium Grade 4 is the highest strength pure unalloyed titanium product. This titanium grade is used almost exclusively for airframe, aircraft engine parts, marine, surgical implants, hydraulic tubing. Good formability and corrosion resistance are its hallmark. Titanium 6AL – 4V ELI is an alloyed titanium product containing 6% Aluminum and 4% Vanadium, ELI (Extra Low Interstitial). 6AL–2Sn–4Zr–2Mo (6-2-4-2)is an alloyed titanium product containing 6% Aluminum, 2% Tin, 4% Zirconium, 2% Molybdenum. 6AL–6V–2Sn (6-6-2)is an alloyed titanium product containing 6% Aluminum, 6% Vanadium, 2% Tin. 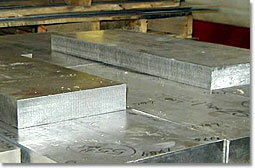 5AL–2.5Sn & ELI (5-2.5)is an alloyed titanium product containing 5% Aluminum and 2.5% Tin. Also ELI (Extra Low Interstitial). 8AL–1V–1Mo (8-1-1)is an alloyed titanium product containing 8% Aluminum, 1% Molybdenum and 1% Vanadium. 15V–3Cr–4AL–3Sn (15-3-3-3)is an alloyed titanium product containing 15% Vanadium, 3% Chromium, 4% Aluminum, 3% Tin.